System) as the printing system. bar to access the CUPS Web Management site. 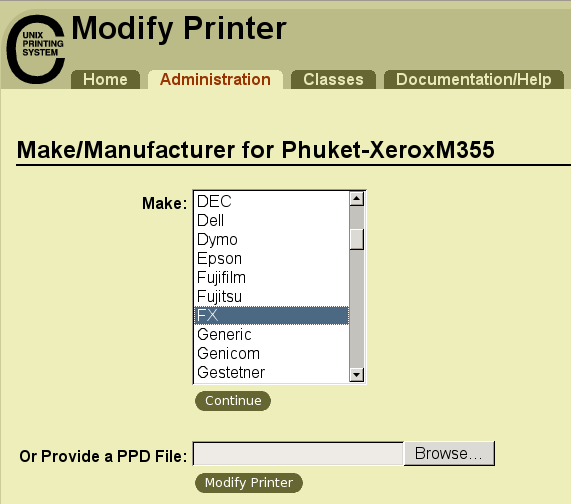 (2) Click [Printers] or [Manage Printers], then click [Add Printer]. [Continue]. You can optionally specify other items. (4) In the [Device...] page, select Connection. (b) Specify [lpd://<IP address of the printer>/<queue name>] in [URI]. (a) Select [USB Printer #1]. (5) Select [FX] for [Make]. (6) Select [FX DocuPrint M355 df] for [Model], the click [Continue]. To Uninstall the driver, execute the following command in a terminal. queries regarding this software and related informations. (C) Copyright Fuji Xerox Co., Ltd. 2012 All Rights Reserved.